CellarTracker is designed so that any data you enter can always be exported. In fact, we recommend you regularly export your own data and save a copy for backup purposes, just in case you need to check the state of your cellar at any point in the past (CellarTracker does not maintain any historical transaction records). You can export data directly from the website to CSV or text format, or for those who are looking for more advanced options, you can also manually download to XML, HTML, tab-delimited text, or comma-separated text (CSV). Exporting from the web interface is very easy. Simply go to the view of the data you'd like to export (e.g., My Cellar), and click the Export button in the top right. That brings up the export dialog, which allows you to choose the columns you'd like to include in the export. The list of available columns is dependent on the underlying view you are on. For example, when on the Wines view of My Cellar, location and bin are not included; if you switch to Individual Bottles view, then location and bin will be included. 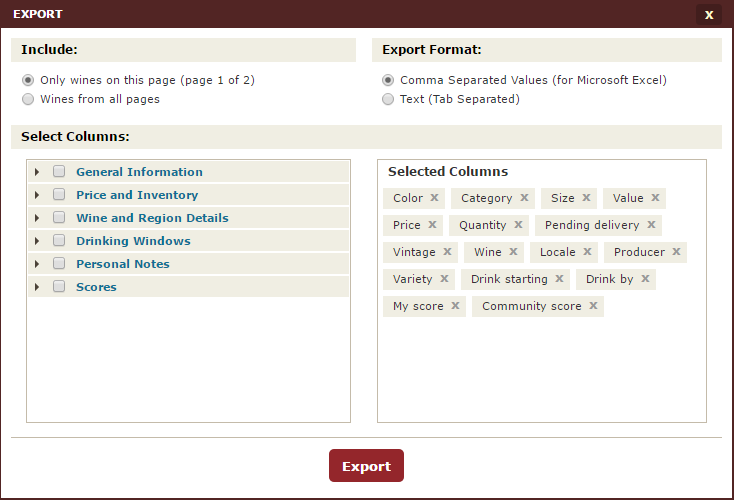 Simply choose your desired columns and format, and click the Export button to download the data. Currently, there is no way to remember your chosen export columns for next time, but this is something we hope to address in the future. Location and Bin: Go to My Cellar and then switch into Individual Bottles view. The output will contain one row for every bottle in your cellar, which includes the location and bin values. Cellar contents (aggregated): Go to My Cellar and then switch into Wines view. The output will contain one row for every wine in your cellar. Purchase history: Go to My Cellar and then change the drop-down to Purchased. The output will contain one row for every purchase you've made. My wine history: Go to My Cellar and then change the drop-down to All Wines. The output will contain one row for every wine that you have attached data to, meaning wines you've previously had in stock (but since consumed), wine's you've added tasting notes for, etc. If you'd prefer to use another tool for format to access your data, CellarTracker also supports the ability to export to XML, HTML, tab-delimited text, or comma-separated text (CSV) via specially crafted URLs. This is the same underlying functionality available in our WebQuery file. The base format for the export URL is as follows; please replace your_handle with your handle, and your_password with your password. Then, append the appropriate additional URL parameters as described in the following sections. If you paste these URLs into a browser that is logged in to your CellarTracker account, you can omit the User and Password parameters as these are automatically transmitted via Cookies. The Format parameter determines the format of the output. By default, the export format is HTML. The Wine Summary (List) table, by default, does not include location or bin information. However, it can be included if you add an additional URL parameter named Location=1.